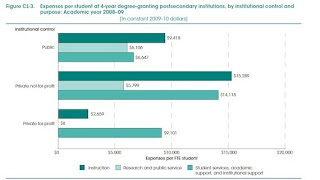 On average, for-profit schools spent $2,659 per student on instructional costs during the 2008-09 school year, compared with $9,418 per student at public universities and $15,289 per student at private non-profit colleges. Meanwhile, the average cost for an undergraduate student at a for-profit college was nearly $31,000, after factoring in grants received. The average cost for private non-profit colleges was $26,600, while students at public universities paid on average $15,600. The entire article which first appeared in the Huffington Post is linked here. While Wisconsin's Republican legislators discuss legislation that make for-profit college students eligible for the state's underfunded Wisconsin Higher Education Grants, the Illinois General Assembly is poised to pass legislation that bars students at for-profit colleges in the state from receiving funds from Illlionois' main need-based grant program. The Illinois measure, Senate Bill 1773, passed overwhelmingly in the Senate last month, but in a form that would have allowed funds to flow to students at for-profit institutions. But with lawmakers facing the need for cuts in the Monetary Award Program, leaders in the state House amended the legislation to say that the Illinois Student Aid Commission "may not make grants to applicants enrolled at for-profit institutions." "Shouldn't our priority be public higher education, which is distressed right now?" Rep. Dan Brady, a Republican legislator, told The News-Gazette of Springfield. The New York state attorney general's office has subpoenaed five for-profit college companies, including two California-based operations, Bridgepoint Education of San Diego and Corinthian Colleges of Santa Ana. The New York Times and Bloomberg reported the investigation, which makes New York one of six states where attorneys general are known to be investigating for-profits' business practices. Attorneys general in Florida, Iowa, Illinois, Kentucky and Massachusetts have launched similar probes (see chart below). The New York attorney general's office is also looking into Career Education Corporation, Lincoln Educational Services and Trump Entrepreneur Services. Corinthian Colleges spokesman Kent Jenkins said the company had received a request for documents on Thursday and plans to comply with the demand. He described the request as wide-ranging and general, saying it did not make specific references to the company's one campus in the state of New York – Everest Institute in Rochester. Corinthian runs more than 120 campuses in 26 states and Canada under the Everest, Heald and WyoTech brands. Then-California Attorney General Jerry Brown spent three years investigating Corinthian Colleges and filed a lawsuit [PDF] in 2007 alleging the company inflated its job-placement statistics, lied about how much students could expect to earn upon graduation, and offered programs that failed to meet minimum legal standards. The company that year paid a settlement of about $6.5 million to the attorney general's office for consumer education and protection, and debt forgiveness for former students, among other uses. The company also agreed to stop enrolling students in 11 programs in nine California campuses, according to its 2007 annual report. But Corinthian admitted no wrongdoing, and some describe the sanctions as a slap on the wrist. A spokeswoman for Bridgepoint Education said the company would comply with the subpoena, but she did not provide additional details about the request. Bridgepoint enrolls about 78,000 students in mostly online programs under the Ashford University and University of the Rockies brands, according to its most recent annual report. The company also has two campus locations in Colorado and Iowa. Bridgepoint was the focal point of a March 2011 hearing of the Health, Education, Labor, and Pensions Committee. As the Huffington Post chronicled, Bridgepoint executives built the multimillion-dollar company by buying up small colleges that had regional accreditation but were financially strapped. The company brought in $600 million in federal financial aid in 2010, while nearly two-thirds of students who had enrolled in 2008-09 had dropped out by September 2010. “In the world of for-profit higher education, spectacular business success is possible despite an equally spectacular record of student failure,” Sen. Tom Harkin, D-Iowa, said at the hearing, according to a Bloomberg report. Earlier this month, Kentucky Attorney General Jack Conway said he is also leading a joint investigation into for-profit colleges by 10 state attorneys general. The New York Times reports that only half of four-year college grads are landing jobs that require a four-year degree and that starting salaries have fallen from $30,000 in 2006 to 2008 to only $27,000 in 2010-11. And these are the lucky ones. Only 56% of four-year college grads even held a job. These results makes a Wisconsin technical college education look quite attractive. The Wisconsin Technical College System’s Graduate Follow-up Report indicates that 88 percent of 2009- 2010 technical college graduates were employed within six months of graduation, 71% in fields related to their field of study. The median starting salary for all technical college grads was also higher than salaries earned by four-year college grads at $31, 198. And, of course, technical college students graduate with significantly less debt than their four-year counterparts. The New York Times article is linked here and the WTCS Grad report is linked here. At a time when technical college enrollments are soaring, Governor Walker is proposing to slash Wisconsin Technical College System (WTCS) state funding by 30% and freeze the property tax levy at its current level. In an analysis of these proposals, Wisconsin Budget Project warns that Walker is jeopardizing the state's fragile economic recovery by asking Wisconsin's technical colleges to take a disproportionately large cut especially following years of declining state aid. The WTCS was established in the early 1970s with three equal sources of funding, one-third state aid, one-thrid property taxes, and one-third other sources. As recently as 1990 the state contributed 30% of the sixteen college system's' funding. By 2010, however, state aid had fallen to a record low of only 8% despite enrollment increases of 36% between 2001 and 2010. Walker proposes to slash another $70 million in his 2011-2013 budget. 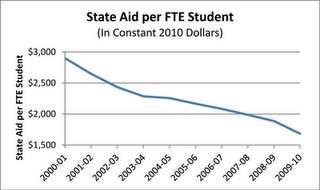 This combination of declining state aid and increasing enrollment means that state aid per student has tanked, dropping from about $2,900 (in 2010 dollars) in 2001 to about $1,700 in 2010, a decline of more than 40 percent. As result, WTCS's students have the largest unmet financial need of all of Wisconsin's college students. Since the early 1990's Wisconsin's business leaders have argued that the biggest obstacle to business expansion and economic growth was the state's shortage of skilled workers. As recently as last week, Badger Meter, Inc. CEO Rich Meeusen, an avid Walker booster, acknowledged that having "a pool of talented employees" was more important to business expansion decisions than low tax rates. Wisconsin's technical colleges have a stellar one hundred year track record of training the state's "pool of talented employees." At a time when firms like Marinette Marine, Oshkosh Truck, Bucyrus Erie and their Wisconsin-based supplier chains are struggling to hire hundreds of skilled workers, cutting WTCS funding and the state's supply of skilled workers is the wrong thing to do. It will undermine the Wisconsin's fragile economic recovery, the prosperity of its citizens and businesses and Governor Walker's campaign promise to create 250,000 new jobs. When the Committee on Joint Finance convenes on Thursday to discuss Walker's WTCS budget proposals it should restore the WTCS's state funding and remove the property tax levy cap. The Wisconsin Budget Project analysis is linked here. The Chronicle of Higher Education reports that faculty at for-profits colleges are under constant pressure to keep students enrolled. Faculty report that they were pressured to ignore plagiarism and inflate grades to keep enrollments high and federal funds, the source of up to 90% of for-profit college revenues, flowing. Not surprisingly Corinthian College's trade school, Everest College, and the Educational Development Management Corporation's (EDMC) Art Institutes are two of the diploma mills whose practices are scrutinized in this front page expose. Both recently opened operations in Milwaukee. In interviews with The Chronicle and lawsuits filed around the country, more than a dozen current and former professors from six of the seven largest publicly traded education companies say they were leaned on to dumb down courses, offer lengthy extensions, and change failing grades. They describe a system in which expectations are low, cheating is tolerated, and faculty are under tremendous pressure to keep students enrolled. "We were supposed to keep students in the classroom by any means necessary," says Luccia Rogers, a former professor at Career Education Corporation's Collins College, who says the college fudged grades and forgave repeated plagiarism—claims that the college denies. "It was all about keeping people in the seats to keep the federal money coming in." In interviews with The Chronicle, current and former professors from a wide range of for-profit colleges said they were pressured­—and in some cases ordered—to offer extensions, forgive plagiarism, and inflate grades to keep students enrolled and the federal aid flowing. Kate M. Burkes, who has taught online courses for the University of Phoenix, said plagiarism is widespread at the college. She said she reported one student for plagiarism seven times. Faculty complaints about grade changes are widespread in the for-profit sector. In recent years, faculty members from several for-profit colleges have filed lawsuits alleging that they had been fired after reporting altered grades or refusing to raise grades. Two such lawsuits are pending against ITT Educational Services, which paid $725,000 to California in 2005 to reimburse the state for Cal Grants awarded to academically ineligible students. The payment settled the state's portion of a lawsuit filed by two former employees that accused the company of falsifying grades to qualify the students for the grants, a claim the company denied. At some for-profit companies, the link between faculty compensation and retention is explicit. The American Public University System pays adjunct faculty members by the student rather than the course, offering $130 per student in undergraduate courses and $150 per student in graduate courses. But students must complete 60 percent of the class for the faculty member to receive the full amount; if a student drops the course before then, the professor gets only 45 percent of the fee, or $58.50 for an undergraduate. 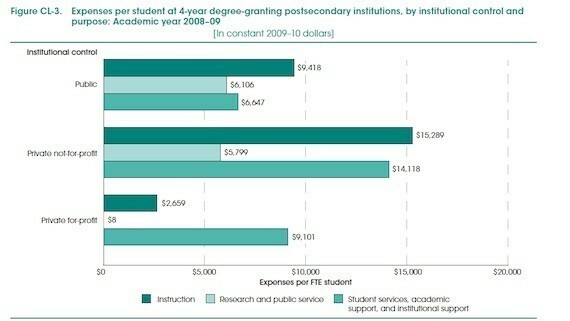 Full-time faculty, which make up a quarter of the total, receive a salary. At Everest College Phoenix online, 15 percent of a professor's evaluation is based on his or her efforts to track down absent and at-risk students to offer "assistance and encouragement." Some campuses of Heald College base 20 percent of each faculty evaluation on "student outcomes," a category that takes into account student surveys as well as retention and pass rates. The target rate for each is 85 percent, according to Ayn Embar-Seddon O'Reilly, an instructor who has taught online courses for both Everest College Phoenix and Heald. She says professors with high retention and pass rates are rewarded with pay raises and additional classes. Both colleges are owned by Corinthian Colleges Inc, which enrolls 102,000 students at 120 campuses in the United States and Canada. The entire expose is linked here. Public employee pensions, deferred compensation promised to firefighters, teachers. nurses and others after years of service, are being threatened in states across the country. Wisconsin's pension system is fully funded. According to a new report by the Pew Center on the States, the Wisconsin Retirement System (WRS) is among the best in the nation. Yet, in his budget repair bill Governor Scott Walker proposed that a study group be organized with the task of transforming the WRS from a defined benefit pension system to a defined contribution plan. The former guarantees retirees an income based on their contributions, earnings and years of service. The later would undermine retirees' economic security by tying pensions to the performance of the stock market. But a defined contribution system would enrich the financial managers, presumably Walker campaign contributors, hired to manage the pension fund whether it makes or loses money. The commercial that follows this post is sponsored by the Chicago Federation of Labor. It provides some valuable context for understanding the emerging debate over public employee pensions. The Milwaukee Journal Sentinel’s political bias is again on display in its coverage of Wisconsin’s assembly elections held yesterday. Three special elections were held in districts that had been represented by Republicans. Two of districts are so reliably Republican that the outcome was never in doubt. But the 94th Assembly District which has been held by the Republicans for 16 years is more evenly divided. The seat opened up when 94th District incumbent Mike Huebsch was appointed secretary of the Department of Administration by Governor Walker. Here the election became a referendum on Walker. The winner- Democrat Steve Doyle, an attorney and the Onalaska County Board chair, who won with 54% of the vote despite being heavily outspent by the Republicans. Doyle’s victory was a decisive repudiation of the Governor and his war on public employees in a community that had long leaned Republican. The 94th Assembly District is one of three assembly districts in the 32nd Senate District where incumbent Republican Senator Dan Kapanke is being challenged by Democratic State Representative Jennifer Schilling in a July recall election. As a result, this assembly race was an especially important preliminary event for both parties. Doyle’s decisive victory demonstrates that the anger over Walker’s effort to strip public employees of their collective bargaining rights remains high; that the opposition to Walker has become a potent electoral force; and that political momentum, at least in Western Wisconsin, is with public workers and their allies. Yet the Milwaukee Journal Sentinel doesn’t mention that Doyle’s election was a repudiation of Walker’s agenda. In fact, the headline, “GOP wins 2 of 3 assembly seats” suggests that the election was a victory for the GOP and Walker. The Justice Department plans to intervene in a whistle-blower lawsuit charging that one of the nation’s largest for-profit college companies, the Education Management Corporation (EDMC), defrauded the government by illegally paying recruiters based on the number of students they enrolled, according to a Securities and Exchange Commission filing on Monday. An EDMC affiliated college, the Art Institute of Wisconsin, recently began operations in Milwaukee's Third Ward, in close proximity to the Milwaukee Institute of Art and Design (MIAD). It is one of several for-profit colleges, including Everest College, that have recently opened branches in the city. The Art Institute anchored a controversial development that received $6.5 million in federal New Market tax credits from the Milwaukee Economic Development Corporation. I had written a letter in opposition to subsidizing this development with New Market tax credits because they are designed to promote development in poor communities, not gentrified areas like the Third Ward, and because of the large number of lawsuits against EDMC alleging unscrupulous business practices. The Security and Exchange Commission filing by Education Management, known as EDMC, said “several states” also planned to join in the False Claims Act case, in federal court in Pittsburgh, alleging violations of their state laws. This is the first time prosecutors have joined such a case, one of dozens in recent years that accuse the for-profit college industry of illegal practices devised to increase federal student aid revenue. The company, which enrolls nearly 150,000 students, operates several career-college chains, including the Art Institute, Argosy University, Brown Mackie College and South University. In federal whistle-blower, or qui tam, suits filed under the False Claims Act, private citizens file fraud complaints on behalf of the federal government, seeking to recover public money that was wrongly paid out. The lawsuits are filed under seal, giving the government an opportunity to investigate and decide whether to intervene, so the one against EDMC has yet to be made public. Some such suits have been settled for significant amounts of money. In 2009, Apollo Group, which operates the University of Phoenix, the largest chain of for-profit colleges, agreed to pay $78.5 million to settle one. The United States Department of Education and Senator Tom Harkin, an Iowa Democrat who is the chairman of the Health, Education, Labor and Pensions Committee, have become concerned in recent years that such colleges too often leave their students with mountains of debt and no marketable job skills. The Education Department has taken action to rein in abuses by the for-profit sector but has so far delayed the most controversial regulation it has proposed, the “gainful employment” rule that would cut off federal aid to programs whose graduates have high debt loads and not enough income to pay them. The for-profit schools are lobbying intensely against the rule, and last week more than 100 members of Congress wrote to President Obama asking that his administration drop the gainful employment rule, which they say would cut off access to higher education for many poor minority students. Supporters of the rule say it would not harm poor students but rather protect them from taking out large loans to enroll in expensive programs that would not lead to good jobs.